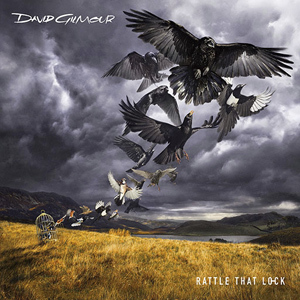 If Pink Floyd‘s mostly instrumental and ambient 2014 album The Endless River left you wishing for more classic elements — like, say, David Gilmour‘s husky vocals and stinging guitar — his fourth solo album, Rattle That Lock, should fit the bill. On his first project since Pink Floyd put an end to their long career with The Endless River, which was pieced together from leftover studio tracks dating back to 1994, Gilmour continues on the path the band laid down decades ago with a concept album about a typical day in the life of a middle-aged man coming to terms with loss, mortality and his varied musical influences. Written by Gilmour with his wife, Polly Samson, Rattle That Lock is both autobiographical and meditative, a look at a life filled with the usual shares of love, hope, hurt and joy. On “Today,” which comes near the end of the narrative, it’s all pretty much summed up with a Floyd-funky rhythm buoying a live-in-the-moment sentiment. It’s not heavy, and it never goes as deep as Pink Floyd classics like The Dark Side of the Moon or The Wall, but for the 69-year-old Gilmour, it’s where life has taken him. The journey to this place is what Rattle That Lock is all about. The 10 songs (led by the melancholy instrumental “5 A.M.,” the title of which recalls former bandmater Roger Waters‘ opening track on his 1984 solo debut, The Pros and Cons of Hitch Hiking, “4:30 AM”) drift along various routes: rock, pop, jazz, ambient. It’s as much Gilmour’s story as it is Pink Floyd’s during the later years. There’s even a tribute to the group’s late keyboardist Rick Wright, whose instrumental tracks were the impetus for The Endless River. Rattle That Lock is more rock-oriented than that record. There are three instrumental cuts, which float somewhere between the ethereal and the concrete, but it’s the songs featuring Gilmour’s voice that invite, for better or worse, the Pink Floyd comparisons. The title track recalls the band’s ’80s and ’90s work, when they were trying to carve out a new identity following Waters’ departure; the biting guitar that caps “Dancing Right in Front of Me” is vintage Gilmour; and “Today” chugs along with Animals-era punch. Still, there’s nothing as majestic as “There’s No Way Out of Here,” from Gilmour’s eponymous 1978 debut, on Rattle That Lock. But following the somewhat exasperated exhale of The Endless River, it’s about as close to a classic Pink Floyd album fans are going to get these days.